My life in South Africa. My world Merchant Navy travels. My life in Australia. On another break-neck speed trip up to Sydney from Melbourne in my Ford Capri, which flew like the wind, to visit Gina and Neil who were modelling in a fashion parade and we wanted to see what the competition was like seeing how Gina had won that trip to Fiji. 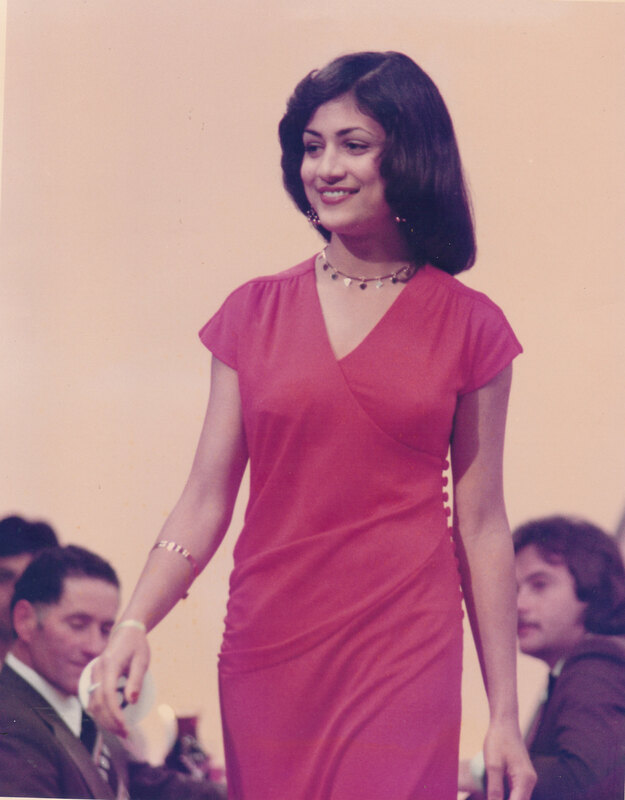 Joan and I were pretty proud when we saw her doing her stuff on the cat-walk and knew why she had won. After that, Joan and I ventured further up the North Coast from Sydney. It was a pleasant one where we encountered everything country, running rivers, seaside resort towns and strings of beautiful beaches all the way to the town of Gosford and to the city of New Castle. The approach to Newcastle from a distance when seeing the vast array of steel girders with the sun glinting off it, smoke stacks and steam emitting from the industrial sites, reminded me of the steel works in Pittsburgh (USA). It stopped there though because the surroundings were a perfect compromise of the robust with the leisureliness of its picturesque harbour at the mouth of the Hunter River, and was in easy reach of the boating at Lake Macquarie and the wineries of the Hunter Valley. On the way, Myall Lakes with a chain of lakes that not only had palms and other wetland vegetation dense on its shores, but also exotic bird life and house boats that could be rented to cruise the lakes. Then a slight detour to Taree; Aboriginal for ‘tree by the river’, on the banks of the Manning River that had a number of beautiful riverside parks and reserves. There were plenty of boating ramps for boating enthusiasts here, as well as in most of the smaller surrounding villages and towns, allowing you quick access to the Manning River and the many tributaries. Just to the north of Taree, the ‘Coorabakh’ National Park; meaning ‘bloodwood tree’, where the remnants of ancient volcanoes dotted the landscape, including the Big Nellie, Fat Nellie and Little Nellie. There were some great walking tracks to try, offering magnificent views of the surrounding rainforests and volcanic formations. Then we wound our way through miles of forest to Port Macquarie where we found the prettiest beaches with golden sand and a chain of ocean lakes where the fish were really bighting. The tree-forested highway began to change to banana plantations and lush greenery from the town of Macksville on the Nambucca River; meaning ‘entrance to the waters’ to Coffs Harbour. We found it to be a strange combination of a deep-water port with freighters just about docked in the town’s centre, and as a holiday resort with many tourists like ourselves enjoying not only the perfect weather but also the many varied attractions like a prawn stud farm and a performing sheep show. Then back through a forested highway that emerged at the city port of Grafton on the navigable head of the Clarence River. It had the Jacaranda Festival with the streets a mass of purple and the carpet of fallen petals on the ground around the tree trunks took on and looked like a reflection on water of the jacaranda trees in bloom. A stretch of alternating rivers and cane fields continued from there to the beach town and fishing port of Ballina, meaning ‘place of many oysters’, and branching off we took the coastal route of breathtaking coastal scenery to the village of Lennox Head and continued on to Byron Bay. The reason for going there was because of information derived from some of our friends who had spent some time there on vacation. Although it might have been a bit of a shock to the system to some when seeing the kaleidoscope of colours and transcendental designs throughout the town’s centre, to me it was like I was back in hippie land. More so when seeing a few kombi V-dubs (Volkswagen panel vans) blazoned with peace signs and flowery designs, womenfolk dressed in the traditional long loose fitting traditional homespun embroidered garments and adorned with bangles and colourful beaded necklaces as was their children, and the menfolk who seemed usually bearded, bare footed and wore either flared or three-quarter cut down shredded bottom jeans with flowery motif shirts. Also a pleasant surprise when finding a group of them at a restaurant singing flower power rebel songs accompanied by a fiddle, guitar, flute and tambourine, which afforded me to shout them a round of drinks for the nostalgia brought; however, what I didn’t expect to see was a group of Hare Krishna’s in their saffron robes chanting and dancing along while handing out flyers and blessings. Locals and visitors seemed to take it all in their stride, even to the whiff of marijuana that mingled with the herbal aroma of incense sticks burnt by the Krishna’s and hippies. We were lucky to be there on their market day, for the whole potpourri of the population were there in all their glory selling commercial and handmade arts and crafts made by the locals in their craft-shops, and we bought and ate the most succulent subtropical fruit on display at stalls. We had seen those fruits (banana, mango, avocado, pineapple, pawpaw, nectarine, peach), and macadamia and pecan nuts that grew in green valleys as the tropics appeared in our drive through and past inland towns, and on our way to the town of Murwillumbah; meaning’ place of many possums’, it still continued with a vestige of sugarcane fields until arriving in the town of Tweed Heads. It was our last stop, and completely driven out all we wanted to do was soak up the sun and unwind so as to rewind our tourist bodies for our return trip back to Sydney. We did though first enjoy our stay there by seeing the sights, which was mostly at the beach and playing the pokies at various clubs. We also sighted Queensland that was reached by walking down Boundary Street, which was the main one that ran through both Tweed Heads and Coolangatta that was the twin town across the New South Wales border, and by stepping across the line clearly defined on the pavement, we arrived in Queensland. We didn’t go any further though, but we did make our way back to Sydney via the New England Highway to Tenterfield that was a must stop for me. It was beyond my comprehension why Harry ‘Breaker’ Morant’s defender at his trial, Major J. F. Thomas, had built a Boer fashioned house there, which although when seeing it brought back nostalgic memories. The town was also later to be made famous as the birthplace of Peter Allen’s grandfather, due to Peter who was an expatriate Aussie singer and performer living in America, who topped the charts with the song written and sang by him called “Tenterfield Saddler” dedicated to the life and times of his grandfather. With that out of the way we headed further down the highway to Glen Innes with the New England Ranges seeming to follow suite until coming upon the New England Plateau of rugged peaks with streams that tumbled into deep gorges on its Tablelands. There we wandered through Inverell’s Pioneer Village spanning the period from the mid 1800’s to early 1900’s of authentic historical buildings that were transported intact from its scattered original sites and set up as an outdoor museum. Also, at Glen Innes where a third of the world’s sapphires are mined we had a go at fossicking, but we never came upon any sapphires, garnets, jasper, agate or any other precious stones except for a few colour lined rocks that we took away as souvenirs. From there we passed through Armidale that was a town of old English charm into spectacular country with rugged peaks and long plains dotted with old mining towns to Tamworth of old and modern musical charm, which is now ‘the country music capital of Australia’ with the yearly Tamworth Country Music Festival and national awards. Then we veered west to take in the Warrumbungle’s; the Warrumbungle’s are a series of volcanic mountains and the name “Warrumbungle” is the local aboriginal word meaning ‘crooked mountains’, before heading for Dubbo; meaning ‘red earth’, and although it looked like nature had really bungled it was worth seeing what fierce volcanic activity 13 million years ago had created with its spiky peaks, craters, ridges, jagged spires and domes that jutted out of the Liverpool Plains. The city of Dubbo was bang smack in the middle of a wheat belt that also had large sheep and cattle stations. What I thought though when visiting their Western Plains Zoo was a two-point consideration. Firstly, that they had the foresight when wanting to place a large variety of world wild animals in settings as near as possible to their native conditions was in penning them in by moats rather than fences and cages, and the other was that if it had to be in the wilds of Africa, those wild animals would have had a good feed of the sheep and cattle. From there we made our way to Sydney past the town of Orange where they grew apples, and where Andrew Bastion ‘Banjo’ Paterson, Australia’s greatest poet, was seeded, born and grew up there. I also then recollected that he was the reporter called Mister Paterson that was with the Aussie troops at the Siege of Kimberley by the Boers that my grandmother had related to me about, what a small world it had become. The next town of Bathurst was another interesting one in relation to South Africa. There I found a Boer War Memorial carrying the name of Lieutenant Peter Hancock who had been the mate of Harry ‘Breaker’ Morant’s, and had faced a British firing squad together for shooting Boer War prisoners. To me it was a pity that they had died that way, for if they had lived they might have gone on to kill the Afrikaner ancestors of those who had introduced apartheid, and although the memorial was most appropriate, I thought a monument would have been better. The Boers had actually respected Henry Harry ‘Breaker’ Morant because he was buried in the Hero’s Acre Cemetery in Pretoria (South Africa) amongst historical Boer figures. And then from a sad memory to a sad place of unnecessary deaths at Cowra; meaning ‘eagle on the rocks’, where 231 interned War World 2 Japanese prisoners of war died while staging a suicidal mass escape. Because of the care the local people over the years had given to their graves at the only Japanese War Cemetery in Australia, the Japanese were that impressed that they have repaid them with an oriental laid out Japanese garden showpiece. We knew we were nearing Sydney when sighting the Blue Mountains from which its residents commuted to there. Although not a true mountain in that sense, but in fact a sandstone plateau reaching a height of only 1 100 metres (3 600 feet), it is blue though. The vast amount of oil-bearing eucalypti trees that constantly released fine oil droplets into the air causes the blue rays of the sun to reflect off it, and that in turn produces a natural phenomenon that wraps the whole landscape in a deep soft blue. The road followed a ridge bounded by high cliffs, enclosed twisting valleys and narrow gorges that were forested with the multicolored sandstone walls that had eroded into rocky bastions and wildly beautiful formations. As a residential area, a cool retreat for Sydneysiders and a must see for tourist, it had heaps to offer not only in its resort towns of Blackheath, Katoomba; meaning ‘shiny falling waters’, and Leura; meaning ’laver’, but also in its combined attractions. 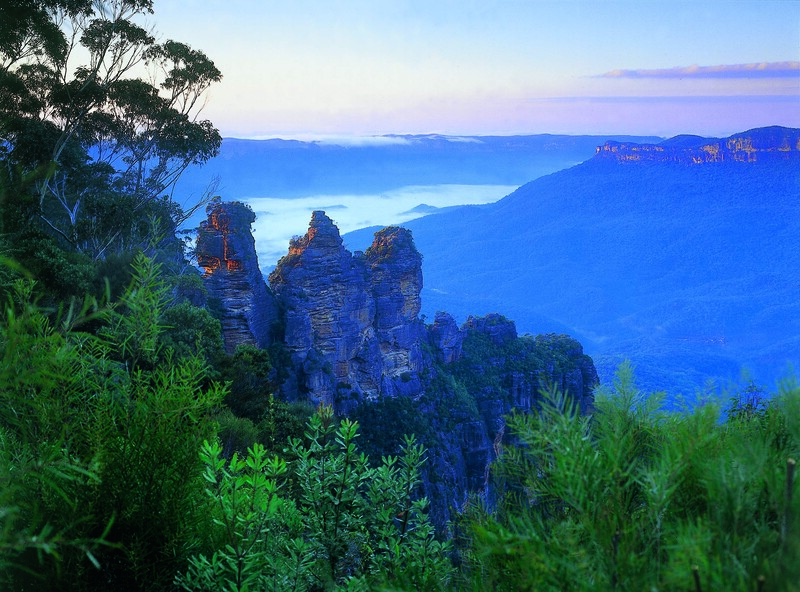 A spectacular lookout at Govetts Leap, the Majestic Hotel that had the finest views from its dining room, the Scenic Railway with a real steep incline ride and a lookout at Echo Point that overlooked three towering stone formation pillars called the Three Sisters. Also, a magnificent mansion called Leuralia that we wandered around in, Everglade Gardens that was more than a garden because it was in a setting high above the Jamison Valley and comprised not only of a natural landscape but also a watercourse area, grotto pool and an Alpine reserve planted with masses of azalea. From there it was a straight run through the city of Parramatta; meaning ’eel creek’, to Sydney, and from there we bade our children goodbye and went back home to Melbourne. Gina modeling on the cat-walk in Sydney. Gina modeling jewelery in Sydney. 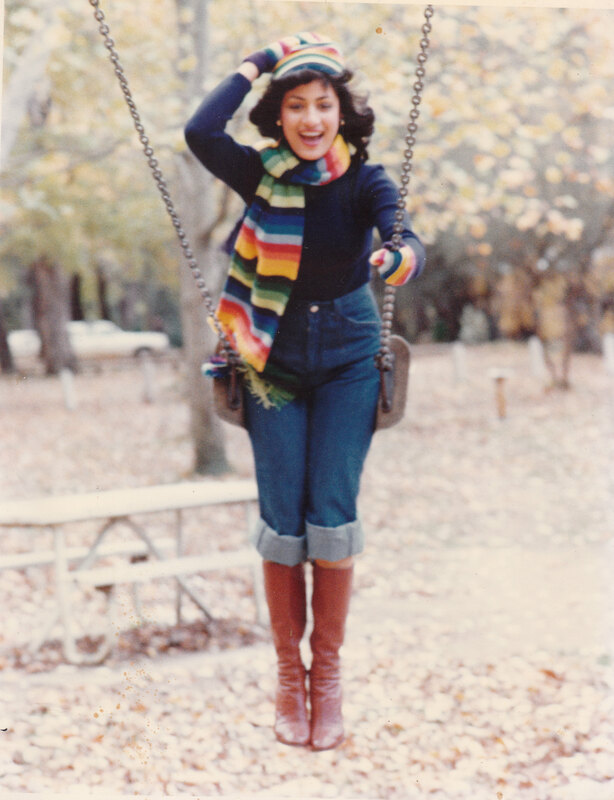 Gina at a clothing shoot. 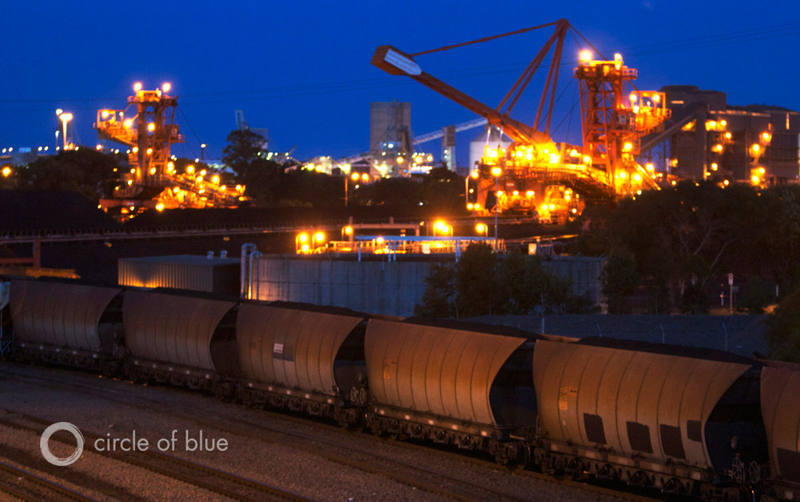 Newcastle’s hustle and bustle at night. Byron Bay of Hippie days nostalgia. 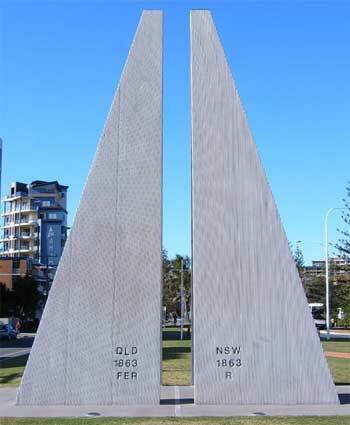 The border marker between New South Wales and Queensland. 13. Cruising the Pacific Islands. 12. It Isn’t What You Know, But Who You Know. 11. Manufacturing ’Black Fellows’ At The Workshop. 10. ‘Over the hill’ but still climbing mountains. 9. ‘The Three Stooges’ Make A Comeback.